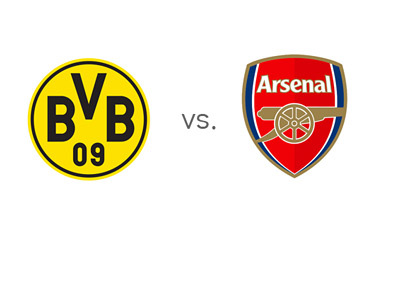 Borussia and Arsenal meet in the fourth round of the UEFA Champions League on Wednesday, November 6th, 2013 at the Signal-Iduna-Park in Dortmund, Germany. Group F is a tight group. Arsenal, Napoli and Borussia all have six points, while Marseille is at the bottom with zero points after three matches played. Borussia are in great form at the moment. After beating Arsenal at the Emirates earlier in October, Juergen Klopp's team went on to beat Schalke 1-3 away and Stuttgart 6-1 at home. Robert Lewandowski scored three goals vs. Stuttgart and is red hot. Dortmund are in second place in the German Bundesliga, one point behind Bayern Munich. Arsenal are also in fine form. At the moment, Arsene Wegner's side are first in the English Premier League, five points clear from second place Chelsea. Since losing to Dortmund, Arsenal have won their two league games vs. Crystal Palace 2-0 and Liverpool 2-0. In the Capital One Cup, at the end of October, Arsenal were outplayed by Chelsea 0-2 at home. Borussia Dortmund are the favourites to win. A 100 € bet on the home side could return 70 € in profit, while the same bet on Arsenal could return 400 € in profit. The most likely scores, according to the odds, are a 2-1 victory for the hosts and a 1-1 draw, both offered at 7/1. Robert Lewandowski is the favourite to score at 4 /5, followed by Marco Reus at 11/10. Olivier Giroud is the favourite to score for Arsenal at 11/5. Mesut Ozil and Aaron Ramsey are both valued at 4/1. Jack Wilshere will probably miss the Dortmund clash for Arsenal due to an ankle injury. Will Borussia's 'heavy metal' approach to football again dominate Arsenal's possession based 'silent song' game? The oddsmakers say yes. Let's see how things play out on Wednesday.